The new Jeep Wrangler JL offers a modern twist on a classic name. The all-new Jeep Wrangler JL offers a modern twist on a classic name. Adventure awaits in the all-new Jeep Wrangler JL, a contemporary spin on an iconic Jeep name. This legendary vehicle retained everything you loved about the classic model, such as the seven-slot grille, removable top, and square frame, while adding a few modern tweaks as well. 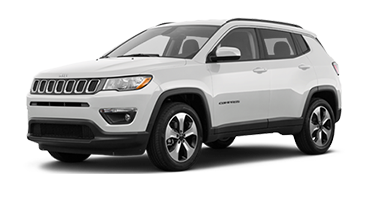 Lower the windshield down to truly open up the main cabin, while 33” all-terrain tires offer the traction you need for any terrain. 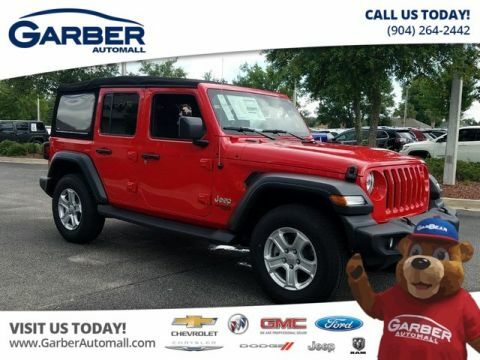 Whether you’re off-roading along the beach, cruising through Jacksonville, or even commuting to Orange Park, the new Jeep Wrangler JL is equipped to handle any road condition. All those good looks aren’t just for show though, as the all-new Jeep Wrangler JL is the most capable Wrangler yet. Choose from three different 4×4 systems to optimize your driving experience, while available systems such as Hill Descent Control help ensure superior traction in the roughest of terrain. It’s just a few of the way the Jeep Wrangler JL was designed with you in mind. 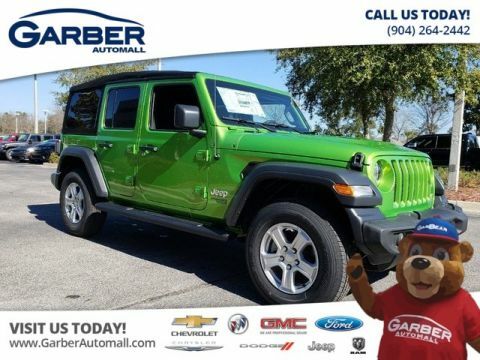 Experience the innovation for yourself, by stopping in to Garber Automall in Green Cove Springs for a test drive. At first glance, the all-new Jeep Wrangler JL may seem like a familiar face, but take a closer look and you’ll discover little modern updates that distinguish it from previous Wrangler body styles. 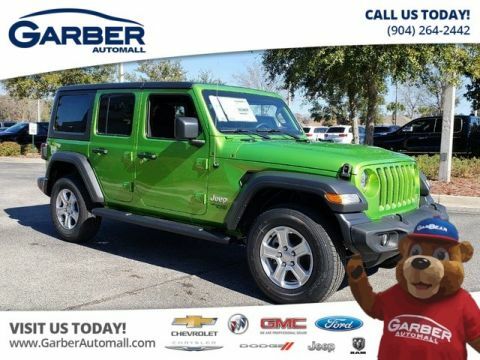 The JL still boasts the classic Jeep features you love though, including a fold-down top, removable doors, and seven-slot grille. Hit the trail and have some fun. Get heads turning everywhere you go in the all-new Wrangler JL, which offers a modern twist on a legendary vehicle. 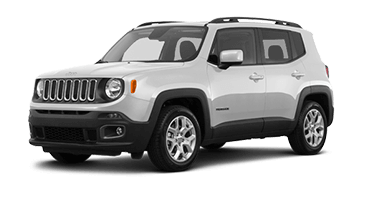 Beginning with the classic frame style, the new JL model features an updated steel bumper, LED headlamps, and famous seven-slot grille. Tucked behind the front fender flares you’ll discover new air extractors, exclusive to the Wrangler JL. These conveniently placed vents help cool the engine compartment as you’re blazing along outdoor trails. The ability to customize your driving experience is one of the things that made the classic Jeep famous, and that capability continues in the all-new Wrangler JL. 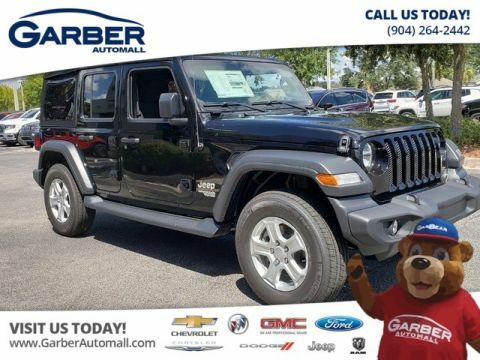 With this innovative Jeep, you have the option to remove all four doors, take the top off, and even easily fold down the windshield, allowing you access to the great outdoors from all sides. With the all-new Wrangler JL, you can choose the two door option for a classic Jeep look. 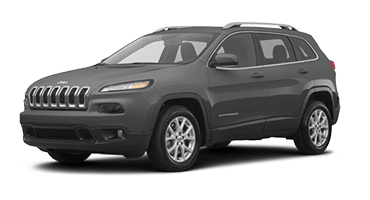 Or, opt for the four-door model if you’re planning on bringing some friends along for the ride. 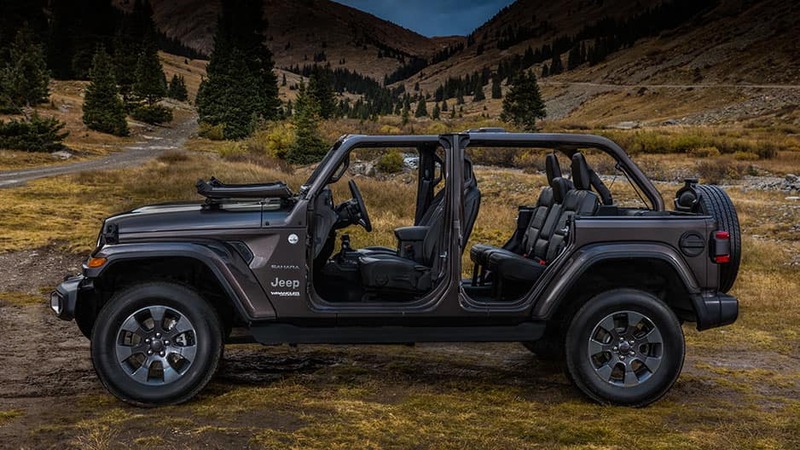 The all-new Jeep Wrangler JL makes it easy to enjoy the open air, courtesy of its removable top. Offering a hardtop, soft top, or the new Sky One-Touch™ Power Top, you can experience the breeze through your hair and the sun on your skin while you’re out adventuring. Style and comfort follow you onto the backroads in the all-new Jeep Wrangler JL. With a rugged yet functional dashboard, heated front seats, and smart storage options, the new Wrangler JL is ready for any adventure. Just because the all-new Wrangler JL was designed for rough terrain, doesn’t mean that the interior can’t be as stylish and comfortable as a more traditional city vehicle. The beauty is in the details with the Wrangler JL, complete with premium leather and contrast stitching to create a relaxing cabin. Enjoy maximum comfort in the all-new Jeep Wrangler JL’s newly designed seats, which provide optimum support on top of being heated. Simply press a button to activate the heated cushions and you’ll stay toasty warm on your morning commute. 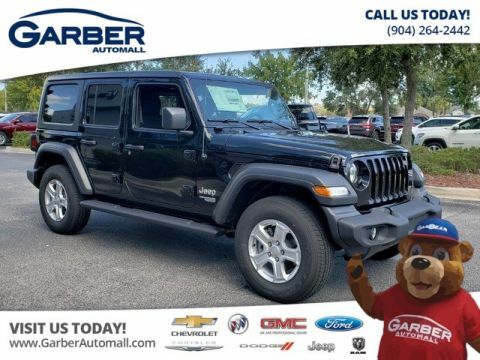 The all-new Jeep Wrangler JL knows how to maximize the space it’s been given, with smart storage options including a lockable center console and glove box, as well as a hidden compartment in the rear. Have as much fun as you’d like in the all-new Jeep Wrangler JL, which features an innovative wash-out interior. Thanks to one-way drain valves in the floor, you can remove the carpets and spray out the inside cabin with a hose, keeping mud and dirt at bay. Never have arguments over the interior climate again thanks to dual-zone temperature control, which allows you and your front passenger to set individual temperatures and keep everyone happy. 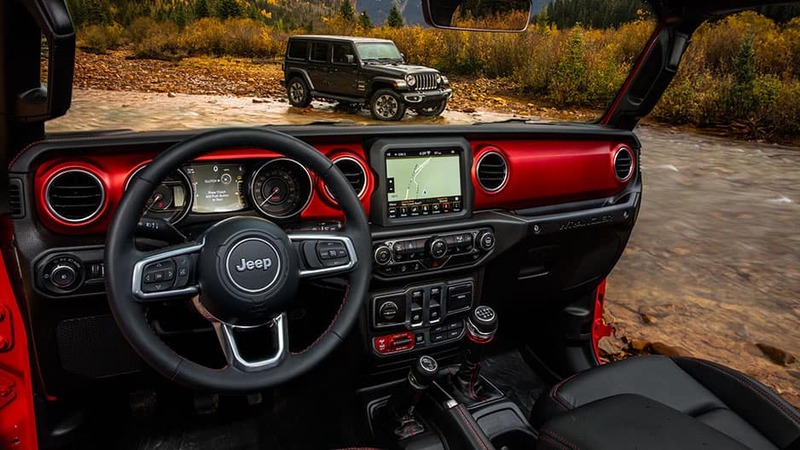 The adventure is just getting started in the all-new Jeep Wrangler JL, which offers the latest in advanced technology features to keep you entertained on your drive. With Uconnect® Multimedia, Alpine® Premium Audio, and SiriusXM® Satellite Radio, no journey is ever boring again. With the all-new Wrangler JL’s innovative Uconnect system, you can seamlessly integrate your compatible mobile device with the built-in touchscreen. Connect using Apple CarPlay® or Android Auto® and enjoy the ability to answer calls hands-free, stream your favorite music, or navigate through unknown cities. Take advantage of the available Alpine Premium Audio System in the new Jeep Wrangler JL and allow eight strategically placed speakers to carry you away with their unparalleled sound. Factor in active noise cancellation technology and you’re in for one enjoyable ride, free of unwanted clamor and full of your favorite tunes. Keep your eyes front and center with the available custom-configurable 7” Multiview Driver Information Digital Cluster Display. Personalize the gauge to show exactly what you want to see, whether it’s directions from a navigator, media information on currently playing music, or off-road statistics, amongst other things. The all-new Jeep Wrangler JL features a convenient 115-Volt Power Outlet, so you can charge your phone, laptop, or any other electronic on-the-go, without having to use an adaptor. 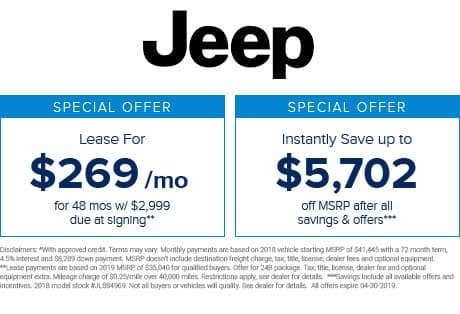 Enjoy a free 1-year subscription to SiriusXM Satellite Radio’s All-Access Package with the new Jeep Wrangler JL. Stay entertained no matter where the road takes you, with unlimited access to commercial-free music, sports, comedy, and so much more. 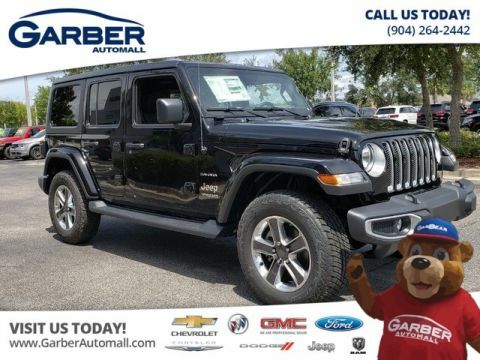 Whether you’re tackling the back roads or cruising through downtown, you can rely on the all-new Jeep Wrangler JL to have your back with the latest in advanced safety technologies. By offering available systems such as Blind Spot Monitoring and Hill Start Assist, you can drive anywhere with confidence. 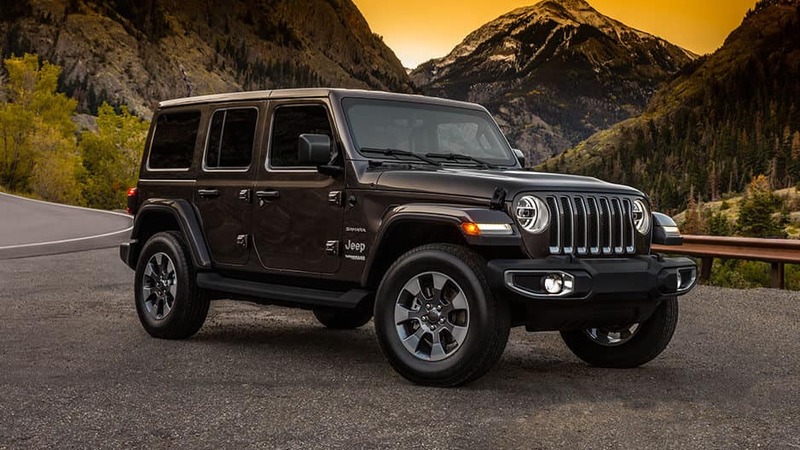 Perfect for off-roading or tackling steep urban streets, Hill Start Assist helps prevent the all-new Jeep Wrangler JL from accidentally rolling backwards on take-off up a hill, in order to avoid an unintended collision. 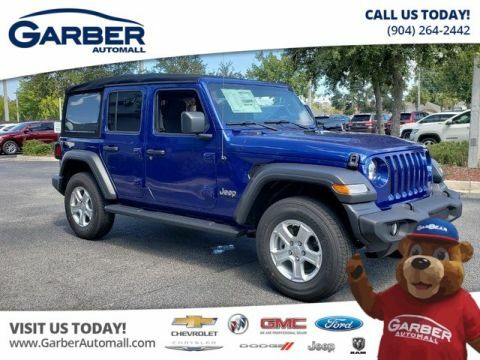 As you’re reversing out of a tight parking spot or driveway, you can trust the all-new Wrangler JL to be watching for traffic crossing behind you. 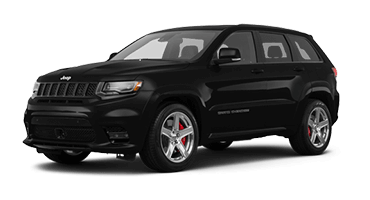 If it detects a vehicle approaching, it will alert you with both visual and audible warnings, so you don’t have to worry about any unwanted surprises. Using sonar sensors in the rear bumper, the all-new Wrangler JL can detect objects behind you as you’re reversing. The system will warn you of a potential hazard if it senses you’re getting to close to a detected object while backing up. Place the all-new Wrangler JL into reverse and the touchscreen will instantly begin showing a live feed of the area directly behind you, complete with dynamic guiding lines. Reversing out of crowded parking sports or driveways has never been easier. 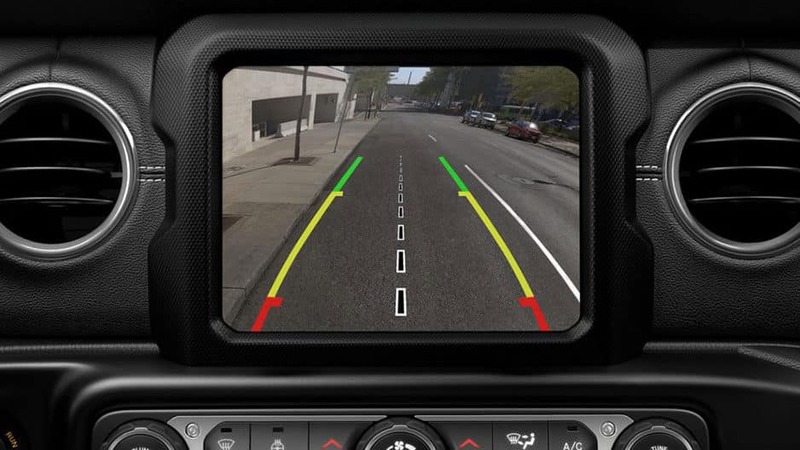 With this available system, the all-new Wrangler JL utilizes radar technology to detect when there is a vehicle traveling in your blind spot, warning you with alerts on the side-view mirrors. It’s just one more way the Wrangler JL is keeping an eye out for you. No terrain is off-limits in the all-new Jeep Wrangler JL. Sporting the prestigious Trail Rated® badge, the new Wrangler JL has passed a series of tests to certify that it can withstand harsh conditions while still offering remarkable off-road capabilities. With the legendary 3.6L Pentastar® V6 engine, the all-new Wrangler JL is prepared for any adventure. Kicking out up to 285 horsepower and 260 lbs. of torque, the Wrangler can tackle any tough terrain that comes your way. 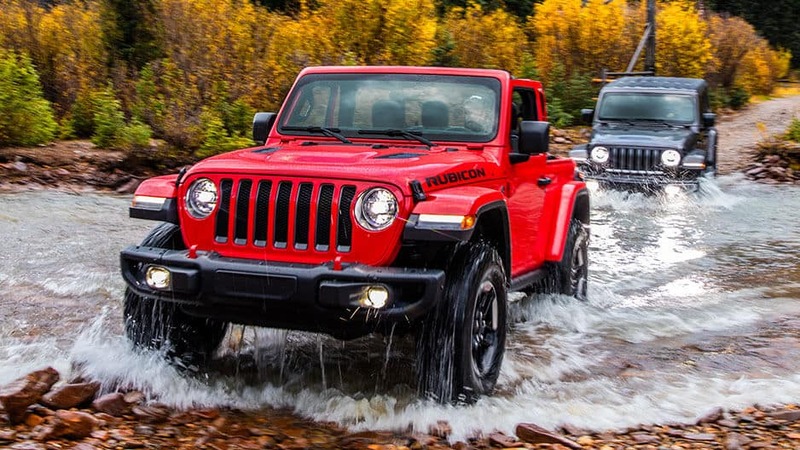 When it comes to superior traction control, the Jeep Wrangler has long been ahead of the game. Choose between three available 4×4 systems based on how you want to play; whether you’re looking for tighter grip or more flexibility and efficiency, the new Wrangler delivers. The all-new Jeep Wrangler JL is truly capable of handling nearly any road condition – even when water’s involved. 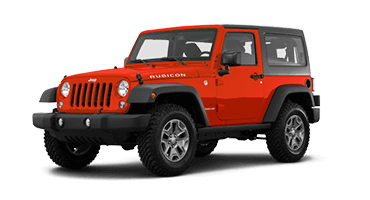 Tackle small creeks, streams, and deep rainstorm puddles without worries, thanks to the Wrangler’s air intake positioned high in the engine, moisture sealed electrical components, and tightly closed body openings that keep water out. Available on the Jeep Wrangler Rubicon, the new 33” BFGoodrich all-terrain tires ensure you’ll be dominating even the roughest of trails. Offering more ground clearance and improved traction, these tires provide a ride better than ever before. With available Hill Descent Control, you’ll be able to control your speed while headed downhill over rough terrain in the all-new Jeep Wrangler JL. You can focus on steering without having to ride your brakes, ensuring maximum concentration. The fun’s just getting started in the all-new Jeep Wrangler JL. Slip behind the wheel and let the surprisingly luxurious interior of the Wrangler JL surround you. Featuring heated front seats, innovative storage options, and premium materials, you’ll feel right at home both on and off the roads. You’re going to be having a lot of adventures in the new Jeep Wrangler JL; make sure you’re staying connected, with the state-of-the-art Uconnect® multimedia system. Bring your favorite music along for the ride or answer phone calls hands-free; whatever you need, the Wrangler JL can handle it. 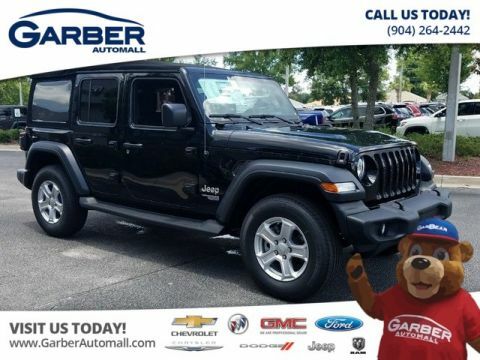 Don’t wait any longer to discover the all-new Jeep Wrangler JL, available for a test drive today at Garber Automall in Green Cove Springs.